I’d like to see an online quiz that reveals what our preferred dipping sauce for baked chicken tenders says about us. Do you keep it classic with ketchup? Go bold with mustard? 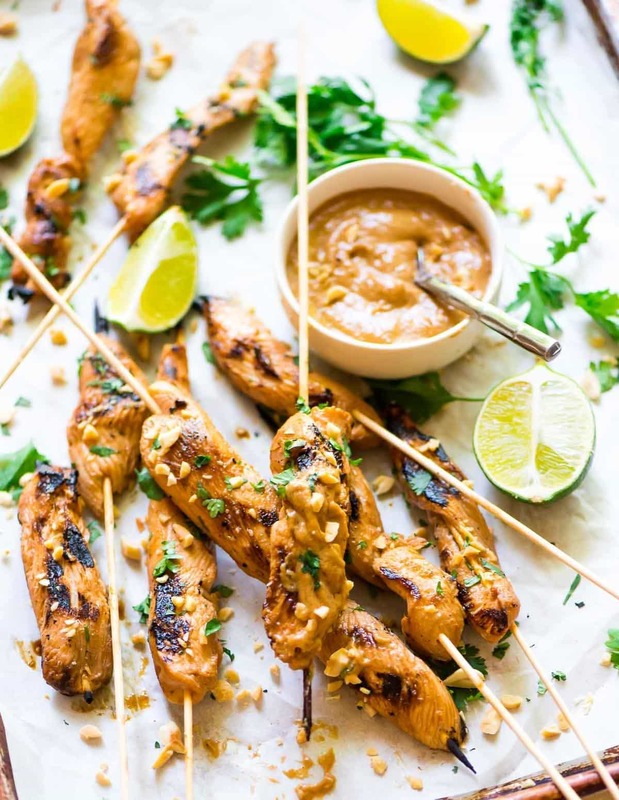 Stay simple and enjoy chicken strips unadorned, in their crunchy, juicy glory? 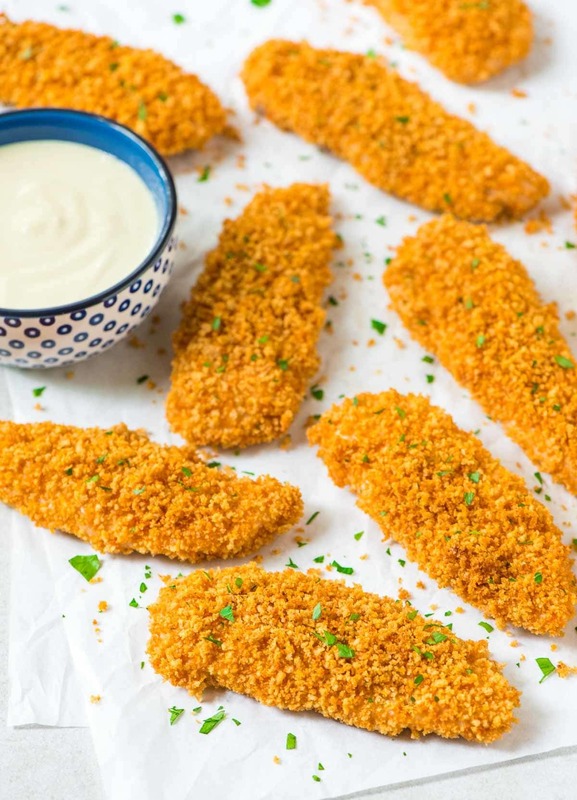 Today’s recipe for baked Honey Mustard Chicken Tenders combines my two favorites, honey and mustard, to create a healthy, easy dinner that’s fit for kids and grown-ups alike. In grade school, whenever my mom let my sisters and me pick where we stopped for lunch, McDonald’s was the default choice. I always ordered the chicken McNuggets with honey for dipping, a habit that, in retrospect, I’m surprised my mother endorsed. She would have had no issue with the chicken nuggets—it’s the prospect of an open container of honey on the loose in the back seat that baffles me. Maybe I was neater than I remember. Or maybe the few minutes of silence the chicken strips and honey bought her were worth risking a sticky seatbelt. These days, I’ve moved on from honey to mustard as my baked chicken tender dip of choice. (Does that mean I’m less sweet than I used to be? Mom, don’t answer that.) I’m also much more apt to make my own homemade chicken tenders versus pulling through a drive-through. Making your own baked chicken tenders from scratch is fairly quick and easy. 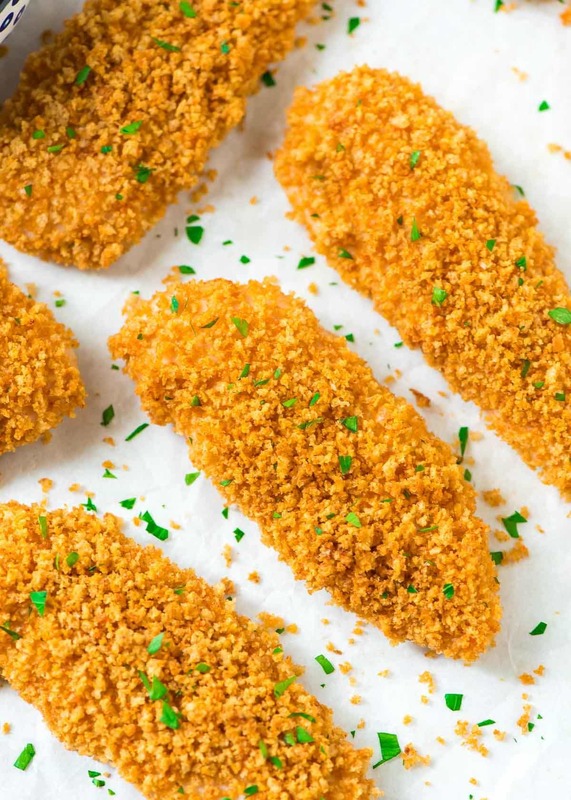 Unlike heavy drive-through fare, homemade chicken tenders are healthy and something you can feel good enjoying on a regular basis. Today’s baked Honey Mustard Chicken Tenders combines my chicken finger favorites of then and now: honey and mustard. I used both to make an easy buttermilk honey mustard chicken marinade, then breaded the chicken in whole wheat Panko bread crumbs. 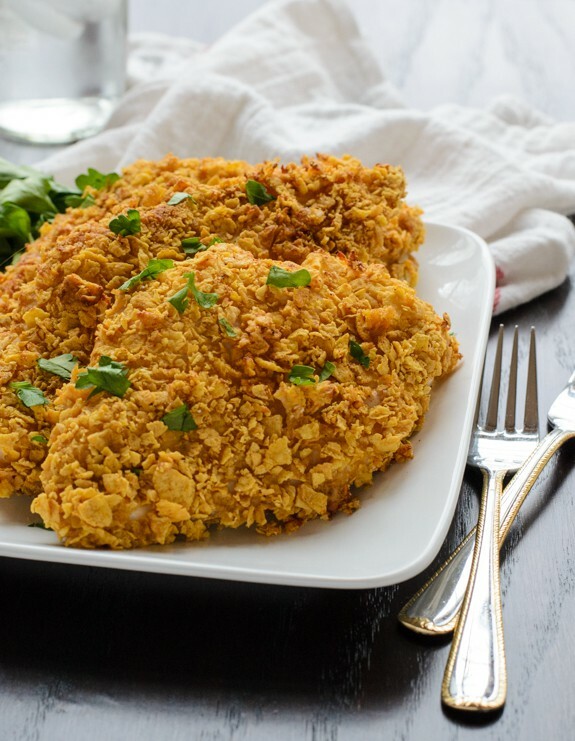 The marinade locks in the honey mustard chicken’s moisture and gives it a lightly sweet, zippy flavor, and the crunchy Panko bakes into a crispy, golden crust. To make sure every spec of the honey mustard chicken’s surface area was properly coated with Panko, I first dipped the chicken strips in Phil’s Fresh Eggs Liquid Egg Whites. 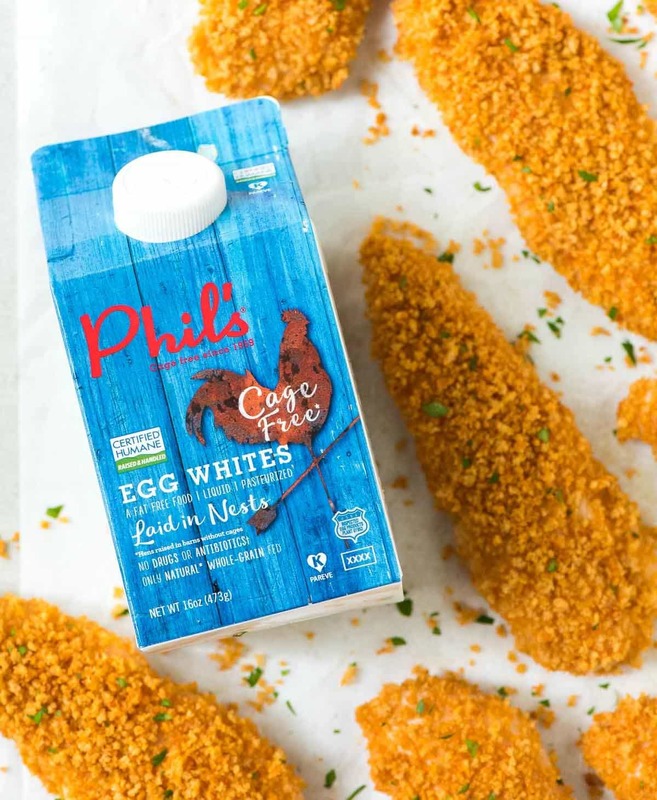 Phil’s—a family run company whose hens are humanely treated and raised on an all-vegetarian diet—is one of the first companies to offer a cage-free liquid egg white option. Not only do I feel better knowing that I’m using a trustworthy product and supporting a family-run company, but I find that you can actually taste the difference in quality. 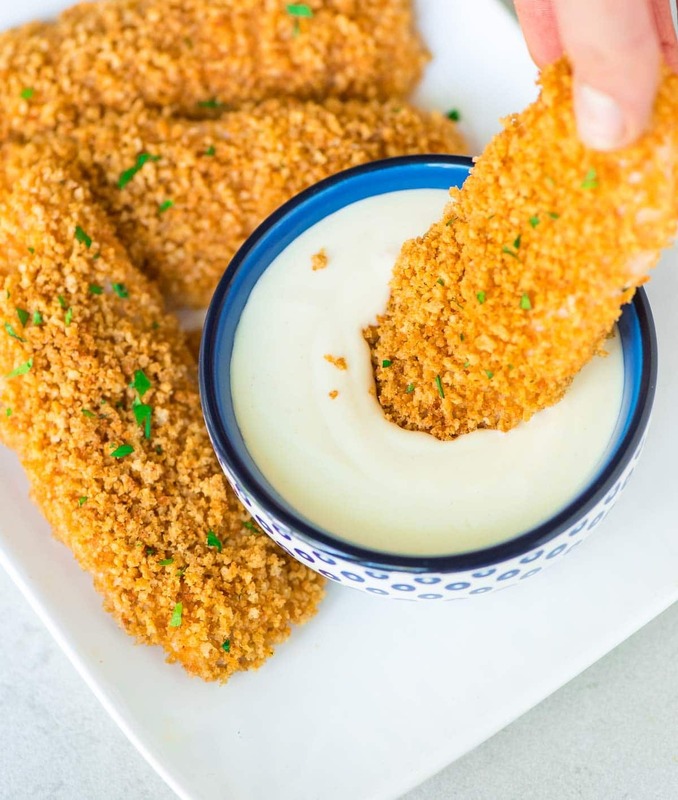 Although these baked Honey Mustard Chicken Tenders would be fantastic dipped in just about anything, I decided to take the honey mustard factor one step further by making a quick Greek yogurt honey mustard dipping sauce. It took about 10 seconds to stir together and was well worth the effort. 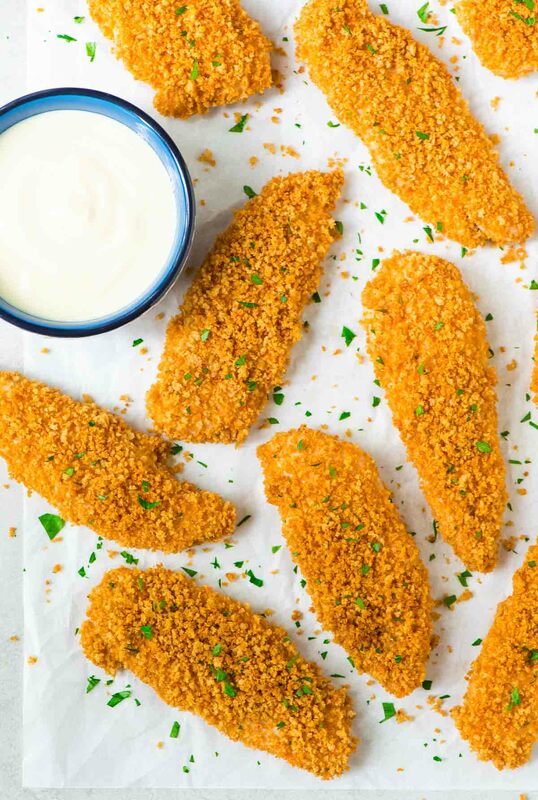 The yogurt dip’s cool, creamy contrast with the crispy Honey Mustard Chicken Tenders makes for one happy meal! Easy Honey Mustard Chicken Tenders. Crispy on the outside and juicy on the inside with a creamy honey mustard sauce. 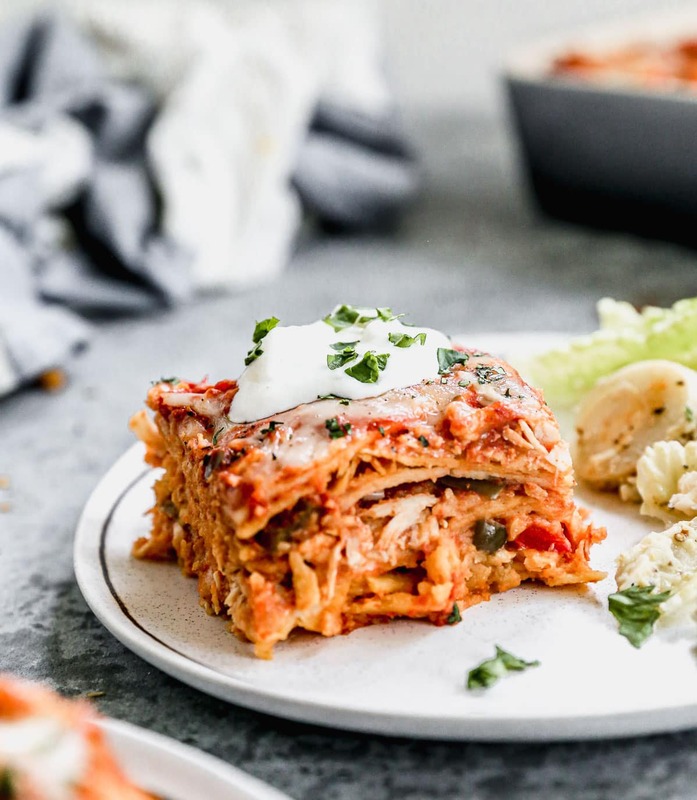 Simple, healthy, and a family favorite! In a large, shallow dish (a 9x13-inch pan works well), combine the Panko breadcrumbs and remaining 1/2 teaspoon salt, 1 teaspoon smoked paprika, 1/2 teaspoon onion powder, 1/2 teaspoon garlic powder. Drizzle the oil over the top, then toss to moisten. Preheat oven to 350 degrees F. Line a rimmed baking sheet with foil, then place an ovenproof wire rack on top of it. Coat the rack with cooking spray. Arrange the bowls in a line from left to right as follows: egg white dish; Panko breadcrumbs; baking sheet. Working with a few pieces of chicken at a time, with your left hand, remove the chicken from the marinade and shake off any excess (this is the "wet" hand). Still with your left hand, dip the chicken into egg mixture, turning to coat all sides, then place in breadcrumb mixture. With your right hand (the "dry" hand), pat the chicken on all sides with the breadcrumbs, pressing them on lightly so that the chicken is well coated. Still with your dry hand, place the chicken on the baking sheet, leaving a little space between each. Repeat for remaining tenders. While the chicken bakes, stir the dip ingredients together in a small bowl: Greek yogurt, Dijon, honey, and salt. Taste and add additional honey as desired. Serve chicken hot or at room temperature with the dip. No buttermilk? Stir 1 cup regular milk (1% or 2% is preferable) together with 1 tablespoon white vinegar or lemon juice and let sit 5 minutes. Stir once more then use in the recipe as directed. You can also use regular, unseasoned breadcrumbs in place of Panko, but the chicken tenders will not be as crispy. if I do not have liquid egg whites, how many regular egg whites would you use? Hi Angela! You can use 2 egg whites. Jill, you MADE MY DAY!! Thank you so, so much. I definitely agree with Jill – your recipes always look so good and are surprisingly simple to make. I love having a picture to go with so that I know I’m on the right track. My computer has no printing capabilities so I just copy longhand whatever sounds like a winner…so far, I’ve made some solid choices! Thanks for all the work you put in to make this a really enjoyable site. Chris, I am BLUSHING. Thank you so, SO much!!! I am so grateful to you for reading my blog and making my recipes. It’s my absolute favorite part of blogging. Love me some crispy chicken tenders! While I have never made my own, these seem to be super easy to make and super tasty! I love the greek yogurt-mustard dip with it! Thank you so much! Chicken fingers are a favorite over here too. I just made these and very good! Stayed crispy :). Whole family approved too, which is always nice. Thank you! Thank YOU for trying the recipe and taking time to come back by and leave this lovely review Elizabeth. I’m so glad you all enjoyed it! Hi Kerry, I’ve never frozen this recipe and I hesitate to recommend it because I worry that the breading might get soggy. But if you do try it out, make sure to reheat them directly from frozen. I made these for probably the 10th time last night. Family favorite. That makes me so so happy to hear Elizabeth. Thank you!